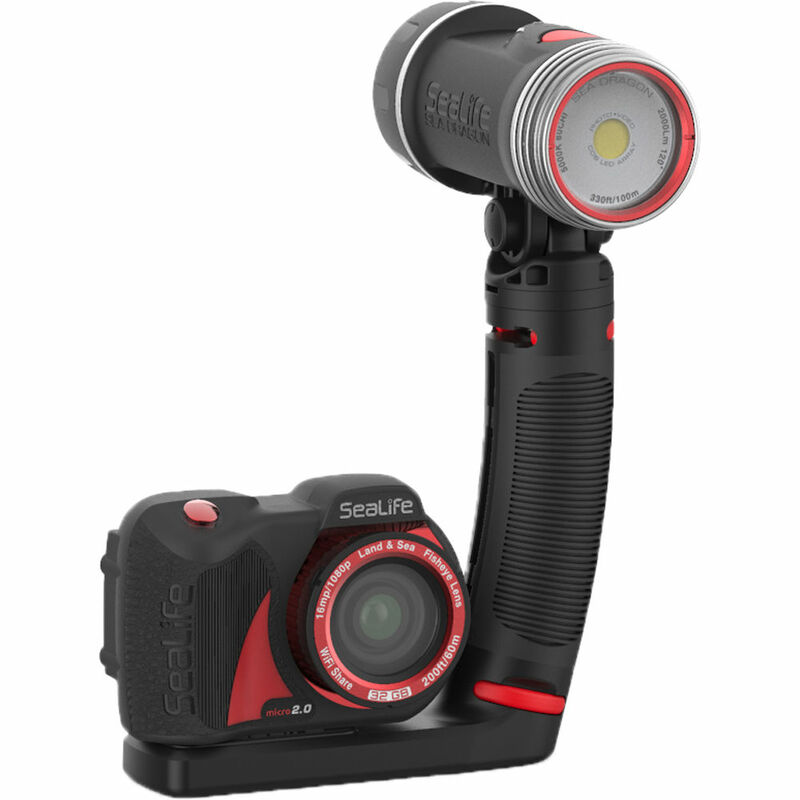 Capture clear, well-lit images of the world below the surface with the SeaLife Micro 2.0 Pro 2000 Set, which bundles the 32GB Micro 2.0 Underwater Digital Camera, the Sea Dragon 2000F Photo-Video Dive Light, and the SeaLife Micro Tray and Grip. Both the camera and light have depth ratings of 200' and are designed to bring out the natural colors of fish, coral, and other underwater life and environments. The Flex-Connect Micro Tray and Grip serve as a modular support system for the camera and light, and can easily be supplemented with optional accessories. Capture clear images below the surface with the 32GB Micro 2.0 Underwater Digital Camera from SeaLife. This compact, waterproof point-and-shoot has a depth rating of 200'. It is permanently sealed, having no watertight doors and no o-rings to maintain, and is protected by a rubber-armored, shock-resistant body. The camera features a 16MP, 1/2.3" Sony CMOS image sensor for sharp, detailed photos and full HD 1296/30p or 1080/30/60p video. The Micro 2.0 is also equipped with a wide-angle fisheye lens with a 35mm-equivalent focal length of 20mm, a 130° angle of view, and a fairly fast f/2.8 aperture, enabling you to fit a lot in-frame and capture effective low-light shots with shallow depth of field. Additionally, it is configured with 32GB of internal memory and runs on an internal lithium-ion battery. Compose your shots on the Micro 2.0's 2.4" TFT color LCD monitor. Benefit from 3 underwater scene modes, as well as a land mode for out-of-water use. The camera is also capable of time-lapse shooting, enabling you to take images at set intervals to see change over a period of time. With the Picture in Video feature, you can capture still images while recording Full HD video. The camera also features Wi-Fi for previewing, downloading, and transferring images to your smart device with the free SeaLife app. Features a depth rating of 200' and is permanently sealed, so there are no watertight doors and no o-rings to maintain. Additionally, it's protected by a fully rubber-armored, shock-resistant body to safeguard against small drops and bumps. The 1/2.3" Sony CMOS sensor features a resolution of 16MP. Benefit from sharp still image capture and continuous shooting at up to 5 fps in Burst mode, as well as full HD 1080p video at 60 and 30 fps in MPEG-4 / H.264 format. The camera can record video at a maximum resolution of 1296p at 30fps, which is compatible with Apple QuickTime, DivX Plus, YouTube, iPad/iPhone, Android phones/tablets, and select other media players. ISO sensitivity ranges from 100-800. A wide-angle fisheye lens with a 35mm-equivalent focal length of 20mm and a 130° angle of view lets you get close to subjects while maintaining broad coverage. Apparent angle of view is reduced underwater to 80-100°, which fortunately still provides ample coverage. Catch that magnificent humpback whale or school of fish swimming by, or capture a wide expanse of a coral reef to show the diversity of colors and types. The fairly fast f/2.8 aperture lets you take effective low-light shots with shallow depth of field, while automatic correction of barrel distortion helps restore proper shape and perspective to images. Frame your shots on the Micro 2.0 camera's 2.4" TFT color LCD monitor, which features a resolution of 480 x 234. Compact, lightweight design affords easy handling and travel. Soft, textured rubber grip for a secure hold, even when wearing diving gloves. Picture in Video mode lets you capture still photos while recording full HD video. Additionally, Upside-down shooting mode saves photos and movies in the proper orientation even when the camera is positioned bottom-up. Three integrated filters offer optimal color correction in different types, depths, and/or temperatures of water: UW Deep filter is designed for deeper tropical, blue/cyan water, while UW Green is best suited to colder, green/emerald water and UW Shallow is right at home in tropical, blue/cyan water closer to surface. Program the camera to capture images at set time intervals within a designated window, so they can be combined into a video to show change over time. The series can be saved as a video file or a progression of still photos. Wirelessly preview, download, and share pictures and videos to your smartphone or tablet with the free SeaLife app. Configured with 32GB of internal memory for over 25,000 still images or 12 hours of full HD video--with no card required. Runs on an internal lithium-ion battery with a 2350mAh capacity, 3.7V of output power, and a rating of 8.7Wh. Alternatively, when shooting out of the water, you can hook the camera up to the included external power supply for long-term, uninterrupted shooting. The power cord is equipped with a standard North American plug, and the supplied international adapters enable use in Europe, the UK, and Australia, as well. Standard 1/4"-20 tripod thread for connection to camera tray or tripod/monopod. Tray offers attachment points for optional grips and arms that support photo-video lights. Illuminate the underwater world at depths down to 200' with the Sea Dragon 2000F Photo-Video Dive Light Head from SeaLife. It features three outputs from 500-2000 lumens for a run time of 60-240 minutes with the supplied lithium-ion battery. The light offers a wide 120° beam angle, which makes it suitable for use as a main photo/video and primary dive light. Brighten up wide-angle stills and videos and restore rich, natural colors with this nearly daylight-balanced 5000K flood beam with a daylight-mimicking color rendering index (CRI) of 80. Built for durability, the light features a fiber-reinforced polycarbonate body and an anodized aluminum light head, both of which are resistant to corrosion. A push-button switching system makes it easy to turn the power on or off and cycle through output modes. The Flex-Connect Micro Tray from SeaLife is part of a modular underwater photography system designed for customizable setups and easy travel. It is specifically made to accommodate extremely compact cameras, such as the GoPro action cams. The Flex-Connect tray features a standard 1/4"-20 mounting screw for your camera in its waterproof housing, as well as a mounting point for an optional, ergonomic #SL9901 flex arm for a flash or video light, such as the Sea Dragon Digital Underwater Flash or Sea Dragon 1200 and 2000-Lumen LED Lights. Additionally, an optional adapter allows you to use your SL980 light or SL961 strobe. The arm, connected to an optional grip, easily clicks into place on the tray, and the setup is just as easily disassembled with the push of a button. The durable Micro Tray is constructed from fiber-reinforced polycarbonate and marine-grade, stainless steel hardware. This Flex-Connect Grip from SeaLife is a rubber-armored grip that clicks directly into any Flex-Connect underwater camera tray and accepts all Flex-Connect accessories, including lighting arms. It affords comfort and improved handling beneath the water's surface. The ridges down the sides give you a secure hold. Box Dimensions (LxWxH) 7.1 x 5.6 x 4.8"
Box Dimensions (LxWxH) 8.65 x 6.9 x 4.55"
Box Dimensions (LxWxH) 8.3 x 3.4 x 0.6"
Box Dimensions (LxWxH) 9.4 x 3.4 x 0.3"